Not only have new media technologies… actualized the ideas behind projects by artists, they have also extended them much further than the artists originally intended. As a result, these technologies themselves have become the greatest art works of today… [The] computer scientists who invented these technologies… are the important artists of our time, maybe the only artists who are truly important and who will be remembered from this historical period. Is Manovich on the Right Track? In order to address Manovich‘s statement from his 2003 essay “New Media from Borges to HTML,” I’d like to bring up one of my favorite pieces of digital art—”The Wilderness Downtown.” On its homepage, “The Wilderness Downtown” claims to be both a “Chrome Experiment” and an “interactive film.” The essence of the program is inventive—it inputs the address of the audience’s childhood home and creates a music video to Arcade Fire‘s “We Used to Wait” centered around that address. The film’s credits are particularly fascinating; they credit the members and managers of Arcade Fire, the film production team, the interactive production team, and the Google tech team. Think about how the final product would have changed if any one of these teams had been removed. “The Wilderness Downtown” was a joint effort, and it now serves as a perfect example of interdisciplinary art. Without musicians and filmmakers, “The Wilderness Downtown” would simply be code, but instead it’s an experimental (and revolutionary, in my opinion) interactive film. So digital art is interdisciplinary, by nature. And Manovich was half-right: computer scientists are artists, but they’re very clearly not the only ones. It’s generally accepted that we, as humans, possess five senses: sight, hearing, taste, smell, and touch. Certain art forms feature certain senses. Visual arts feature sight. Music features hearing. Music videos feature sight and hearing—the two senses are expected to compliment each other. 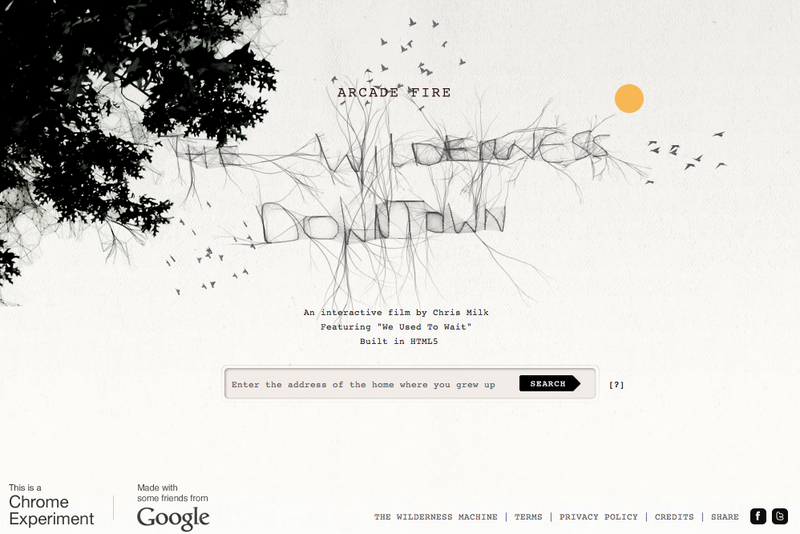 And “The Wilderness Downtown” works touch into the equation, by having the audience members enter their childhood addresses into the text box prominently featured on the page and write themselves letters. Interactions with art in physical manners are made more and more possible by advances in technology, so much so that now we’re getting used to touching the art that we see and hear. In an age where the Internet dominates, people’s opinions are overwhelmingly prominent. News articles, blogs, and videos all allow for comments, and often times the comments are more insightful than the original work. YouTube, the platform on which many videos are originally posted, has a built-in feature for Video Responses. In an age where physical interaction with art is increasingly prominent, how can we criticize for remix? I think a lot of artists are used to their music being reused online and have come to accept and embrace it. You have a generation who go on YouTube and remake and remix music online all the time. They remake and upload songs and videos, and then other people remake the remakes; it just keeps going. It is clearly in a gray area but I believe it should fall into fair use under copyright law. I feel like people are not listening to my music instead of buying a CD or album of an artist I feature. Instead, people find new musicians because of a sample on one of my records. Commercial impact is one of the factors used in determining fair use, and in my opinion the only important one. Should filmmakers and musicians be able to make a living off of their work, without having it stolen? Of course. Commercial success staying equal, should we stop people from remixing works in an age where art is inherently interactive? No. Are the remix-ers artists as well? Yes. Should copyright laws be reformed for today’s society? Considering the interactive, multisensory nature of digital art—yes.